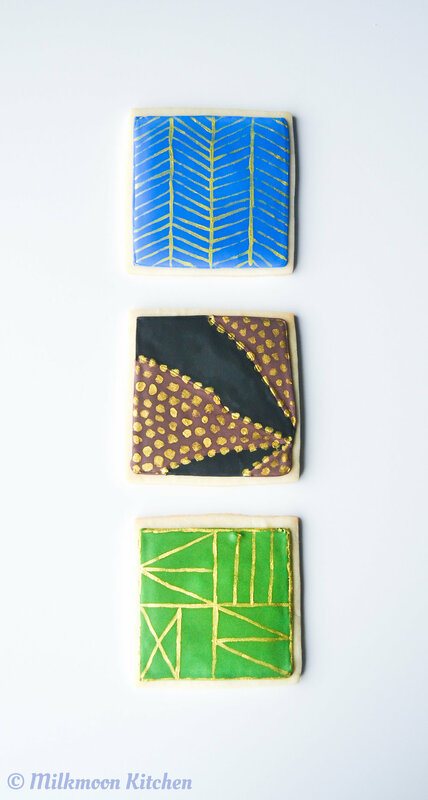 Royal icing cookies aren't usually my jam, but I felt inspired to break out my piping tips after witnessing the fabulousness/excellence that was the costuming in the blockbuster film Black Panther. Ruth E. Carter, the costume designer, created an incredible series of dresses, wraps, suits, etc. that as a former costumer (back in the day at school) I found totally engrossing. I based these cookie designs on the patterns on Nakia's (Lupita Nyong'o's character) green dress, Zuri's (Forest Whitaker's character) face paint, the Dora Milaje's military uniforms, W'Kabi's (Daniel Kaluuya's character) blanket, and some beading and cowrie shells. I grew up on Sun Ra thanks to my dad, but now in my 30s my curiosity about Afro-Futurism has been reignited! I can't wait to see how broader fashion is impacted by this style of design. Do yourself a favor: if you love fashion, design, or aesthetics at all, go check out this film! I have a very pretty cake coming up soon, so I'll be back soon!